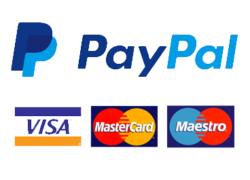 You may pay with either credit or debit cards as well as PayPal. Vertical Unit does not store any credit card numbers. Pay with your Visa, AMEX or MasterCard securely over the Internet. There is no extra charge for card payments.In the event that no payment has been received after submitting your order, Vertical Unit may automatically cancel your order. All products remain in Vertical Unit property until full payment is made. All prices shown on the Vertical Unit website, are including VAT, in accordance with the applicable legislation. In case an order will be shipped to a delivery address outside of Switzerland or Lichtenstein, please note that the VAT is removed at the checkout or earlier depending on which country the product will be delivered to. Please note that in case of an order is shipped to an delivery address outside of Switzerland or Lichtenstein, you may be subject to import duties and taxes, which are collected when the shipment reaches your delivery address. You will be responsible for payment of such import duties and taxes. It should be noted that Vertical Unit has no control over these charges and, since these charges are different for different countries, Vertical Unit cannot predict their amount. Vertical Unit advises you to contact your local customs office for further information. Vertical Unit holds the right to change prices, correct incorrect prices on all orders as well as final sales. If a price is incorrect, this may compel Vertical Unit to cancel the purchase and refund any amount paid in the best way. Consumers have the right to return the order within 30 days from receiving the order. The right applies only in the case that the product and its original packaging can be returned in the same condition as when received. If consumers use their right to send back an order they should contact Vertical Unit in order to get an address to send the goods to. Return shipping is not paid by Vertical Unit. If you live in a geographical area where the postal service does not offer returns, the customer may be obliged to pay for the return shipping. If an item is damaged during transport, Vertical Unit should be contacted within 30 days for information about compensation. Vertical Unit has the right to adjust prices, involve additional cost and change product information such as product pictures and offers without notice. The product images and information texts available reflect the product as much as possible. We reserve the right for any errors that may appear on the page and cannot guarantee that all pictures accurately reflect the true appearance of the product. The pictures may differ depending on the color settings in your computer. Vertical Unit ships worldwide. Deliveries are made in cooperation with the postal services and their partners. You have the right to cancel purchases and return delivered goods by contacting Vertical Unit’s customer service or using the contact form on Vertical Unit’s website within 30 days from receiving the goods provided the goods including their packaging are in the same condition as when you received them. However, the customer is responsible for the risk for transporting the returned goods to Vertical Unit. In cases, you as a customer believe that the delivery is delayed in such a way that you no longer wish to fulfill the order, it is your responsibility to cancel the order. In cases where the order has been dispatched, the customer is required to receive the order. Cancellation is not valid until the customer has confirmed with Vertical Unit either in written form or by email. If a product has been discontinued Vertical Unit has the right to cancel the purchase and refund the paid amount to the customer. Vertical Unit will notify the customer of a replacement or equivalent products if available. Any complaints shall be made to our customer service through our contact form on the contact page. Please supply the order number and the reason for complaint and we will get back to you shortly. Same applies for returns. It is in all types of returns extremely important that the product is packaged in such a way that it cannot be damaged during transit. Vertical Unit has the right to replace defective goods with goods of the same model. If the item has been discontinued, the customer will receive a full refund. In the case that a returned product has no errors or faults, Vertical Unit will send the product back to the customer. All intellectual property rights, such as trademarks and copyright, on the website and in the material published on it are owned by Vertical Unit or its subsidiaries or licencors. Any use of the site or its content, including copying or storing such content in whole or part, other than for your own personal, non-commercial use, is prohibited without the permission of Vertical Unit. The vertical-unit.com website may include user generated content from for example social media applications. Vertical Unit does not claim any ownership in rights in such content (images, photos and videos etc.) and take no legal responsibility for it. In case you suspect a violation of copyright, or any other right, or otherwise is offended by such content, please contact our customer service. KW Enterprises guarantees that the lenses of Vertical Unit Ski goggles will not break under any circumstances. A lens breakage is defined as a full crack or breakage of the lens itself into two or more separate pieces. In case of a claim, the customer needs to provide the broken lens to KW Enterprises for examination. Intentional breakage of the lens is not covered. If the claim is deemed valid, KW Enterprises will provide to the customer either a replacement lens, or a replacement goggle. This guarantee covers only breakage of the lens and excludes scratches or breakage of other parts of the goggle (except manufacturing defects). The Guarantee is only valid for the original customer and only with the valid original invoice. These terms & conditions were updated: 23.11.2018.